If you are in the real stone veneer world you have been part of a conversation regarding “New England Fieldstone” or “CT Fieldstone” veneer. When people look at a fieldstone product versus a quarried stone they always ask: what’s the difference? The simple answer is that a fieldstone is harvested from a field while a quarried stone is sourced from a quarry. 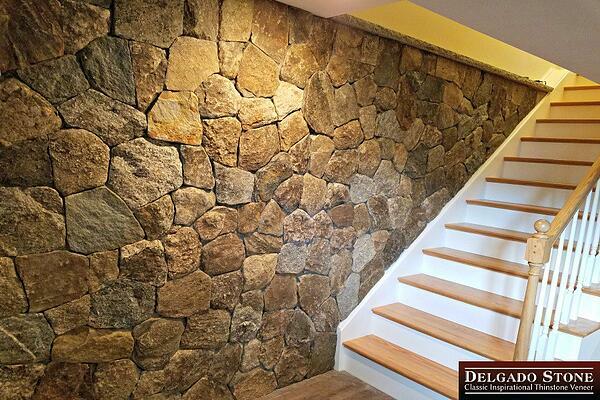 New England Fieldstone is named because it is harvested from open fields and farms throughout New England. You may see some of it on a road trip in as a wall while others are scattered over acres of empty fields. Unlike a quarried stone, you can’t “dig” or “blast” for more fieldstone. Once the field has been harvested, that stone is gone. Forever. Old New England Rounds on Governors Island (New Hampshire). Work done by Stonehenge Masonry.